I recently did a writing unit in my class about blog posts. I’ve taught my students in my class in the past to blog before, but this was the first time I had a very specific focus in mind. At Learning 2.013 in Singapore, I attended a session titled, “Everything is a Remix: Learning 2.0 Edition” presented by Rebekah Madrid (@ndbekah). In this session, we discussed what Creative Commons (I also wrote about it in one of my “Sidenotes” – cool infographic I found on Educlipper is there too!) was used for and the idea of remixing. From this discussion someone verbalized the main idea so perfectly: “Remixing is no longer a tech issue, it’s an academic honesty (plagiarism) issue.” That idea hit home for me. Yes, with the licenses available through Creative Commons, we can now duplicate, edit, and remix what we find, but giving credit to the creators is part of a student’s academic integrity. Using media found on the internet needs to be considered equally important to students citing their sources when they submit a research paper. I wasn’t too concerned with formatting as it was their first time finding things on the internet, so I thought the most basic way to give credit should be what we did first. As the students continue blogging on their sites, I’ll introduce Creative Commons and the search tools (check out the “Sidenote” to this post) they provide so that they can do a more thorough job of giving credit where credit is due. So far, from looking at their blog posts that they have started doing on their own, they are including the websites they found images and linking them to the source. I think it’s a pretty good start. Great blog post. I too (sheepishly) admit to groaning a bit over the effort needed sometimes to credit pictures especially. It needs to be something I do as second nature because I’ve fallen into really bad habits prior to COETAIL. So thank you for the resources you shared. I’ve been frustrated recently because all the images I wanted to use on compfight.com are Shutterstock and really expensive! So I will read your links with real interest. 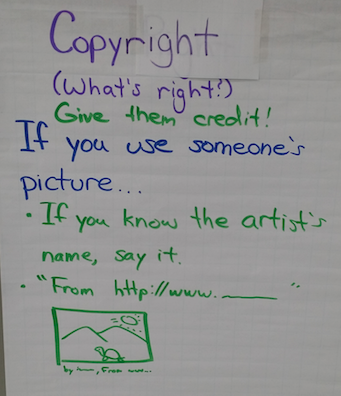 In line with the ‘second nature’ habits, it’s really great that you’re addressing creative copyright and crediting others’ work with your 2nd Grade. Rebekah’s so right. Effort and workload are no excuse for not crediting and by starting students early it becomes far less work and far more second nature. Awesome! So glad Rebekah’s session was valuable for you, and that you’ve been able to start applying those ideas in your classroom!